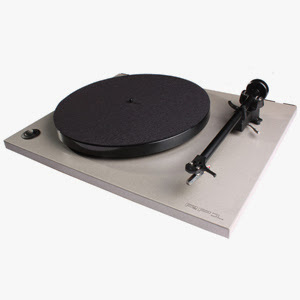 vinyl doing well in new zealand! Vinyl Heaven owner Adrian Roberts says being an "analogue guy in a digital world" works for his music retail business, in spite of, not because of the ubiquity of the world wide web. Roberts set up his music emporium in low overhead premises on Masterton's Jackson St in late 2009, and over two full financial years has watched business expand to an annual turnover of $150,000 - an upswing he is working to continue. "We've found our niche in the market and we're securing it. We're trying to grow the business every year." 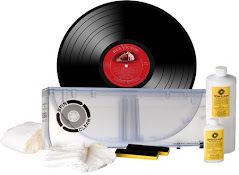 The initial fiscal spurt is down to a "vinyl renaissance" that has sparked renewed interest in the revolving platters, inspiring teenagers to dust off their parents' record collections, veteran music fans to replace worn out tapes and records with CDs. "What I'm seeing is teenagers finding Dad's old record player and then coming into the shop and buying vinyl." British band Happy Mondays have recently confirmed the original line-up will be reforming for a reunion tour this year. 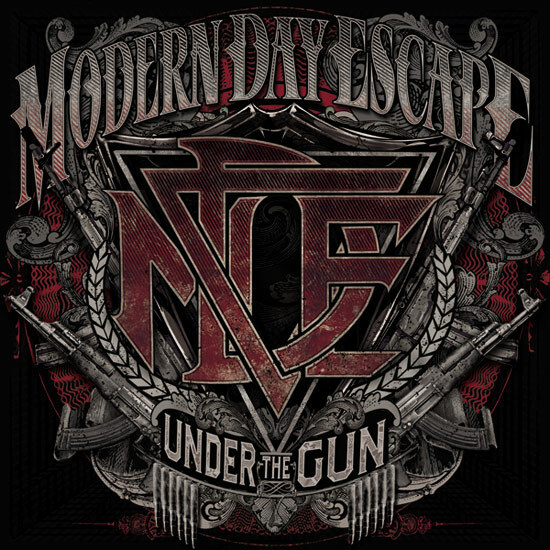 The group disbanded 19 years ago as frontman Shaun Ryder's drug addiction spiralled out of control, and when they reunited in 1999, original guitarist Mark Day and keyboardist Paul Davis refused to join the comeback. Recent rumours suggested the musicians have put their differences aside for a set of reunion gigs and now singer Rowetta has confirmed they will be undertaking a month-long tour in May with the full original line-up. She tells BBC News, "We want to put on a really good show. We decided it would only be special and work if it was the total, original line-up. We're all really excited. They are my family these boys, I've really missed them and I'm sure they've missed each other." 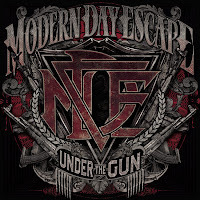 California hard rockers Modern Day Escape have revealed the cover art for the band's sophomore effort called 'Under The Gun,' which is scheduled for release on March 27th via Standby Records. The Chambers Brothers, who scored a major hit in 1968 with Time Has Come Today, are reuniting for a new album and summer tour. Being voted as one of Los Angeles' top 50 bands was such an honor for them that they made the decision to bring the band back together. "This is an anthem of peace and love," Ringo Starr sings with irony on the opening track of his 17th solo album. not really music trivia, but interesting none the less: In 1933, "The Lone Ranger" debuted on WXYZ Radio in Detroit. Next it was heard on the Mutual Broadcasting System radio network; and finally on NBC's Blue Network, which became ABC. The last of its 2,956 original episodes was broadcast September 3, 1954. Transcribed repeats of the 1952–53 episodes continued on ABC until June 24, 1955, and then selected repeats appeared on NBC from September 1955 until May 25, 1956, giving the radio series a total run of more than 23 years. In 1955, although more than half a million jukeboxes were scattered around North America, US manufacturer AMI finally introduces the pay-for-play devices in the UK. Company president John Haddock says he intended to target the ever growing coffee house market first. In 1956, Elvis Presley recorded a cover version of Carl Perkins "Blue Suede Shoes," which will reach number 20 on the US Pop chart in April. Recording cover versions of songs was standard practice during the 1940s and 1950s, and "Blue Suede Shoes" was one of the first tunes RCA wanted their new performer, Elvis Presley, to record. "Heartbreak Hotel" and "Shoes" rose on the charts at roughly the same time. RCA, with its superior distribution and radio contacts, knew it could probably steal a hit record from Phillips and Perkins. For his part, when Presley, who knew both Perkins and Phillips from his days at Sun Records, gave in to pressure from RCA, he requested that they hold back his version from release as a single. The Elvis version features two guitar solos by Scotty Moore, along with Bill Black on bass, and D.J. Fontana on drums. According to Scotty Moore, when the song was recorded, "We just went in there and started playing, just winged it. Just followed however Elvis felt." According to reports confirmed by Sam Phillips, RCA producer Steve Sholes agreed not to release Presley's version of the song as a single while Carl's release was hot. Moore has said that Presley recorded the song to help out Perkins after his accident. "Elvis wasn't really thinking at that time that it was going to make money for Carl; he was doing it as more of a tribute type thing. Of course Carl was glad he did. It really helped as his record started going down." "Blue Suede Shoes" was the first song on the groundbreaking album Elvis Presley, which was released in March. 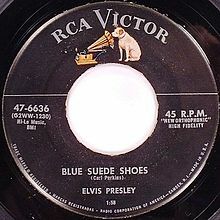 RCA released two other records with "Blue Suede Shoes" the same month: one an Extended Play with four songs, RCA EPA 747, and a 2x extended play version with eight songs, RCA EPB 1254. In 1961, Jerry Leiber and Mike Stoller announce they are forming an independent production company. In 1961, the Shirelles became the first girl group to have the number one song on the Billboard Hot 100 when "Will You Love Me Tomorrow" reached the top. They would go on to place ten more hits in the Top 40. The song reached #4 in the UK. In 1965, following her 1963 #8 hit "The Nitty Gritty", Shirley Ellis reaches #3 on the Billboard Pop chart and #4 on the R&B chart with a novelty tune called "The Name Game". In 1967, the Beatles had their first day of shooting on the promo video for Strawberry Fields Forever. In 1969, with Billy Preston sitting in on keyboards, The Beatles performed in public for the last time when they played a 42 minute rooftop concert above Apple Corps headquarters. The show was stopped by the police after neighbors complained about the noise. It had been 2½ years since the Beatles had played Candlestick Park, San Francisco, on August 29th, 1966. They performed "Get Back" (take 1), "Get Back" (take 2), "Don't Let Me Down" (take 1), "I've Got A Feeling" (take 1), "One After 909," "Dig A Pony," "I've Got A Feeling" (take 2), "Don't Let Me Down" (take 2), "Get Back" (take 3). In 1973, After recently changing their name from Wicked Lester, Gene Simmons, Paul Stanley, Ace Frehley and Peter Criss make their first appearance as KISS at the Popcorn Club in Queens, New York. The band formed in 1970, under its original name Rainbow. Notable original members were bassist Gene Klein and rhythm guitarist Stanley Eisen, later to be known as Gene Simmons and Paul Stanley. In 1971 the band changed their name to Wicked Lester, and recorded an album for Epic Records, which was never officially released. The sessions have been released in bootleg form as The Original Wicked Lester Sessions. Paul Stanley placed an ad in The Village Voice stating, "LEAD GUITARIST WANTED with Flash and Ability. Album Out Shortly. No time wasters please." The ad ran for two issues, December 7 and December 14, 1972, leading to several audition sessions. One audition was by Paul "Ace" Frehley who showed up wearing different colored shoes, walked into the room without saying a word, hooked up his guitar and started playing. Frehley was asked back for a second audition and was a member of the band by Christmas 1972. Within a few weeks, the group had changed its name to Kiss and played their first concert on January 30, 1973. In 1970, Edison Lighthouse were at #1 on the U.K. singles chart with “Love Grows (Where My Rosemary Goes).” The group's only Top 40 hit spent five weeks at the top of the charts. In February 1970, Tony Burrows became the first (and still the only) person to appear on BBC Television's Top of the Pops fronting three different acts in one show: Edison Lighthouse (who were #1 that week), White Plains and Brotherhood of Man. In 1974, Bob Dylan gave his first New York concert in eight years at Madison Square Garden. 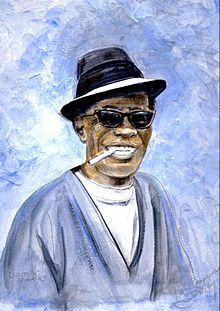 In 1980, blues singer/pianist (Mardi Gras In New Orleans, Big Chief) Henry Byrd, who performed as "Professor Longhair," died after a heart attack at age 61. In 1982, country blues singer/songwriter/guitarist Sam John "Lightnin'" Hopkins died of esophageal cancer at age 69. In 1989, George Michael has a big night at the 16th American Music Awards, winning Favorite Album for "Faith" and Favorite Male Artist in both the Pop / Rock and Soul / R&B categories. In 1999, after spending 11 weeks on the chart, Britney Spears started a two-week run at #1 on the US singles chart with “...Baby One More Time.” Britney's debut album also went to #1 on the U.S. chart on the same day. In 2008, Madonna topped Forbes magazine's list of the 20 top grossing females. The 49 year old material girl banked $72 million between June 2006 and June 2007, while Barbra Streisand and Celine Dion followed, taking home $60m and $45m respectively. In 2009, after a two year battle, James Brown's family reached a settlement over the late Soul singer's estate that would divide Brown's remaining assets and give his beneficiaries the ability to make money by using his music and likeness. Half of Brown's assets were to go to his charitable trust to educate his grandchildren and needy students in Georgia and South Carolina. The rest would be split between his surviving spouse, Tomi Rae Hynie and some of Brown's adult children. In 2011, film score composer (Born Free, The Lion In Winter, Out Of Africa, Dances With Wolves, eleven James Bond films) John Barry died after a heart attack at age 77.